Honeywell Security Systems offers three ways in which analytics and technology can help improve school safety. With the opening of classes this past fall at John Wood Community College in Quincy, Ilinois, the company began testing new technology and data gathering systems that can be rolled out across the country, from elementary schools on up to college campuses. 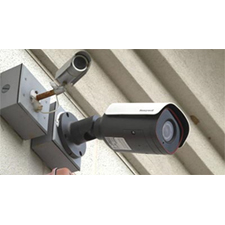 Honeywell teamed up with John Wood school officials and student groups, local law enforcement and local security distributor Alarm Systems, Inc., and spent two days installing special equipment into existing security cameras. The team then staged and recorded typical violent scenarios, giving the analytics technology in the cameras data to inform systems and more quickly detect similar incidents in the future. First, to help the systems detect and report on guns, gunshots and active shooters, local law enforcement acted as “bad guys.” In front of analytics-equipped cameras, police officers armed with empty rifles and handguns were filmed walking up to and around the school holding guns and firing blank rounds. Once inside the building, the “bad guys” carried the guns into the school, simulating an active shooter situation. This was a way to “train” the cameras systems to recognize active shooters with guns and signal an alert, says Adam Yates, a sergeant with the Quincy Police Department who took part in the drill. “To have technology in place that gets all of those [first responder] resources en route quicker, it’s definitely going to save lives,” Yates said. Fights in schools are also a critical security issue. By simulating combative situations – how they begin, crowd response and how they’re broken up – the data collected by the simulations informs the security system cameras on how to recognize the beginnings of a fight in a hallway, cafeteria or even outdoor school grounds., which can help deliver a quicker security response. “We’re taking the cameras and we’re making them smart and giving them the ability to notify us when things are happening when nobody’s watching the camera,” said Bruce Montgomery, a business development manager in Honeywell’s security division who took part in the drills. Finally, by recording and analyzing crowd behavior — even without an active shooter or fight scenario — the data collected from the staging means the school’s cameras will be able to alert school officials if unusual activity is detected. “The technology we’ve been witness to the last couple of days would really impact our ability to respond much quicker than we can now,” said Bill La Tour, dean of operations and chief of police for John Wood. “The ability to be proactive and have an alert of the potential that something bad might happen would be huge."